The PMI California Inland Empire Chapter (PMICIE) is the area's premier project management association, providing Inland Empire project managers with networking, training, and professional development opportunities. We are committed to the advancement of the project management profession and focused on enhancing the personal and professional growth of our members. Whether you are a practitioner or student of project management, joining us can translate into increased professional success. To START, BUILD and ADVANCE your project management career, join now! Improve their professional and personal lives. 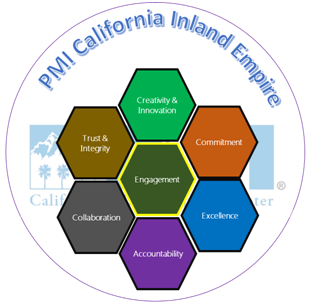 The PMI California Inland Empire Chapter will be recognized in the Inland Empire as a dynamic organization dedicated to serving our communities through the advancement of the Project Management Profession.